Deliciously Savvy received product in exchange for an honest and unbiased review and all opinions are 100% my own. Regardless, I only review products that I am truly interested in for myself and my family and of course for sharing those reviews with my savvy readers. This post contains affiliate links and I may make a small commission used to support this blog, if the product is ordered via the links in this post. Thanks for stopping by and enjoy. It is no secret to anyone that knows me that I love to cook delicious meals for family and friends simply because I love spending time and cooking for them. Cooking and hosting a delicious dinner is one of my favorite things to do, simply because it is the perfect way to get everyone together, which is no easy feat this day and age as we are all so very busy. I love to make the time we spend together extra special by making everyone’s favorite meals and also by ensuring that my dinner table looks as good as the food. 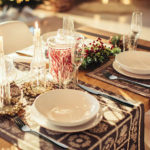 A perfectly dressed table is a must for me and I just love to use my prettiest tableware, glassware and of course flatware as these are all needed items that provide a fabulous and complete look that every dinner table needs. 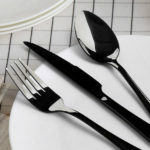 This is why I was so excited to try the 20 Piece Black Stainless Steel Flatware Utensil Set from E-far. I have been wanting a flatware set that had a classic look overall but with a modern touch to it. 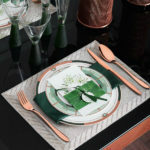 This set is beautifully made and really adds a gorgeous touch to the dinner table. 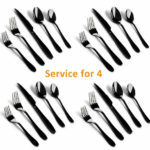 The E-far 20-Piece Black Stainless Steel Flatware Set consists of 4 Dinner Knives, 4 Dinner Forks, 4 Dessert Forks, 4 Dinner Spoons and 4 Teaspoons. 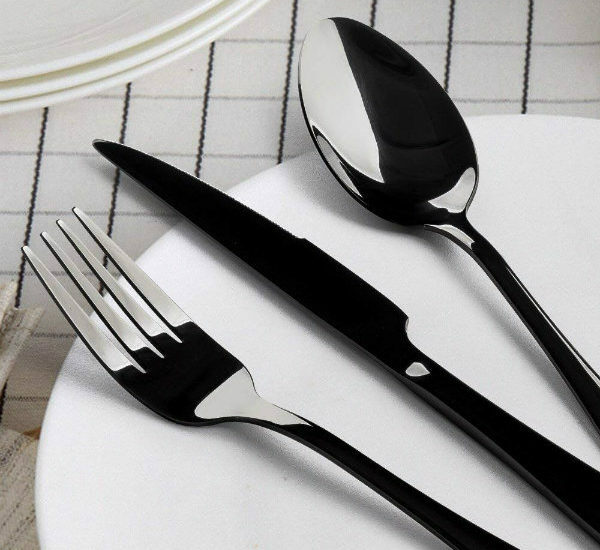 These gorgeous utensils are constructed of stainless steel to ensure durability and safe usage. These are extremely durable and will not bend or break easily and the simple appearance and black stainless steel is timeless and elegant. The result is a gorgeous mirror finish created with pure stainless steel. All pieces are made beautifully and are the perfect weight so that they are extremely comfortable to hold for both adults and children plus they are super easy to clean as they are dishwasher safe. 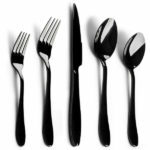 These are perfect for both casual and formal occasions and are now my families go to utensils that we use each and every day. I also love that E-far has a few other color varieties of stainless steel flatware so that there is the perfect set to suit anyone’s tastes and style. 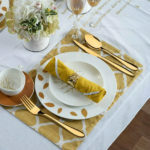 If Black Stainless Steel is not your thing… they have a Gold Stainless Steel Flatware Set for 4 as well as a Rose Gold Stainless Steel Flatware Set for 4 that are equally gorgeous and just as beautifully made to last for years and years to come. These make an amazing gift as well for any time of the year. 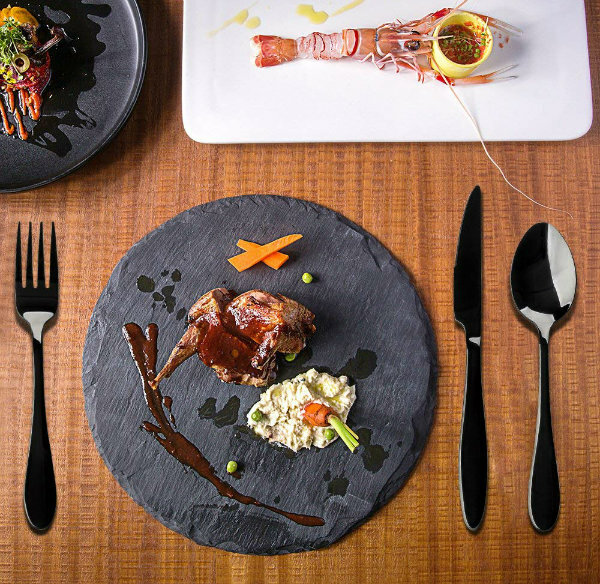 Check out the looks that each of these E-far flatware sets provide as they are the perfect way to dress a table and add that special stylish touch. So what do you think? 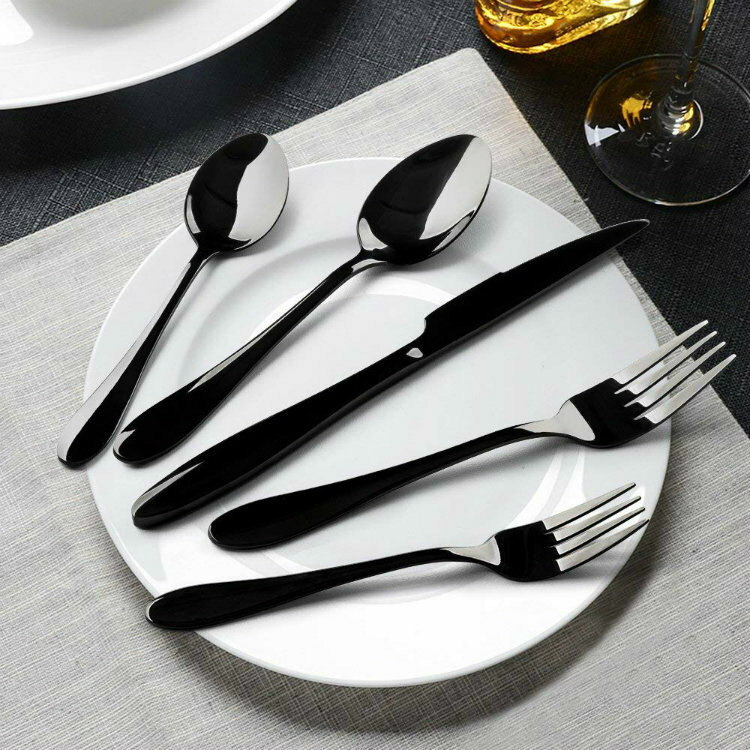 Do you need some new stylish flatware for your dinner table? Right now you can save 10% by using code BSSFOFF10. Hurry…. Ends 8/15 plus if you have Amazon Prime these qualify for free 2 day shipping! As Always, Thank You For Visiting Deliciously Savvy Today & Leave Some Comment Love Or Enter A Giveaway While You Are Here. I Always Love Hearing From You All! Oh, my! This stainless steel flat ware is awesome! Thank you for sharing. I really like the look of these. The black stainless steel is just really attractive. I would love to have these at my table. Black is always so stylish!